Villa Gli Antichi Cipressi is an old Tuscan country house that dates back to the 18th century and has been recently restored. The Villa once belonged to the Piccolomini family, the family of Pope Pius II from Pienza. Their coat of arms is found on the Villa’s façade. The Villa is located in a pamoramic position on the sloping hills between the historic towns of Cortona and Montepulciano. It is surrounded by olive groves and vineyards that produce the famous Vino Nobile di Montepulciano. This landscape is characterized by beautiful abbeys, hot springs, famous wine cellars, farms and many small towns and country villages that are celebrated for their Medieval palaces and squares. Within the Villa’s gates guests can relax on comfortable chairs under the gazebo, take a dip in the private pool that offers a breathtaking view of the surrounding countryside, use the barbecue, ping pong, wood-burning oven, dine on the panoramic terrace and unwind in the Jacuzzi. The Villa is located on the sloping hills between the historic towns of Cortona and Montepulciano. It is surrounded by olive groves and vineyards that produce the famous Vino Nobile di Montepulciano. This landscape is characterized by beautiful abbeys, hot springs, famous wine cellars, farms and many small towns and country villages that are famous for their Medieval palaces and squares. This area is very quiet and perfect for a relaxing vacation. 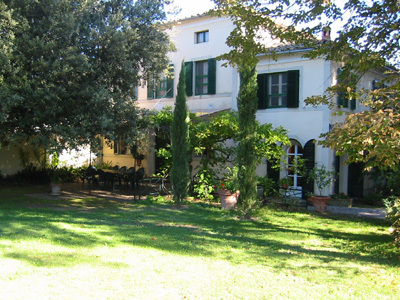 At the same time, the Villa’s location is very convenient for visiting Tuscany and Umbria. The Villa is on a gravel, inclining road. It is advised that guests have a car to arrive at the Villa.